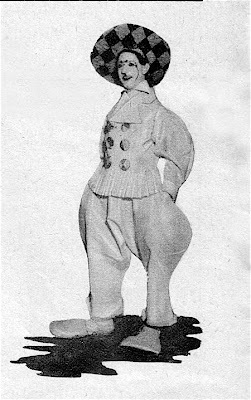 The Toledo, OH Shrine Circus of 1933 was produced by Hagenbeck-Wallace. 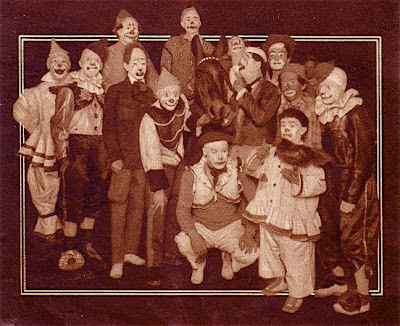 These are some of the clown photos from the program that year. 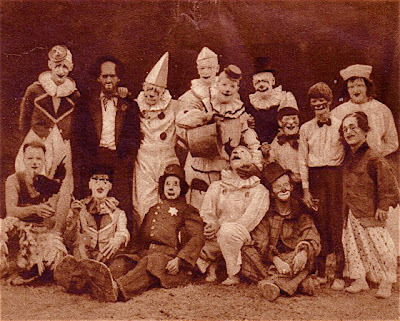 I can't identify anyone in them except for the last, which looks to be Joe "Koko" Coyle. 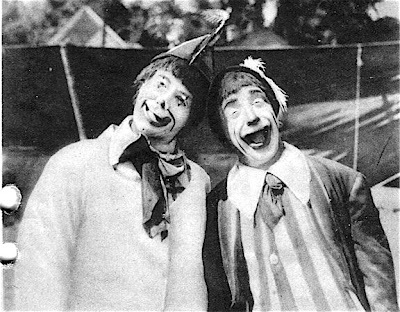 If you were teaching a class of circus comedy novices in "Clowning 101" and had to illustrate the Auguste and Whiteface clown types you could do a lot worse than to choose these two Paul Gutheil portraits of Greg DeSanto (Auguste) and Master Clown, Glen "Frosty" Little (Whiteface). 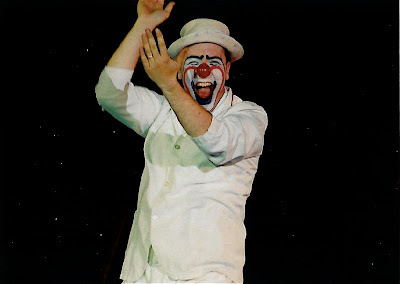 And a great big hello goes out to Scott O' Donnell and the Ringling Blue Alley! I hope to be able to stop by in either Baltimore or Albany. 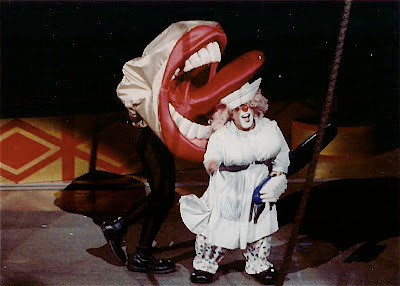 "Dental Assistant" Arturo Figueroa gets a tongue lashing from an unidentified clown during the Dentist Chase on the Ringling show. How often do you get to see a "chase gag" anymore? 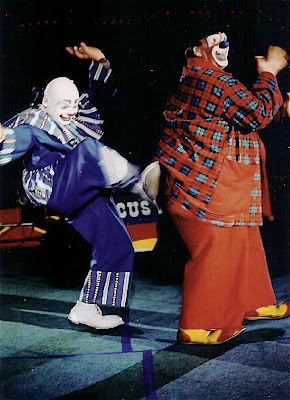 One of the truly great White Clown/ Red Clown partnerships in modern American circus clowning, Billy Vaughn (Auguste) and Mike Snider (Whiteface), seen here on Vidbel's Olde Tyme Circus at The Jaffa Shrine Circus in Altoona. PA circa 2000. 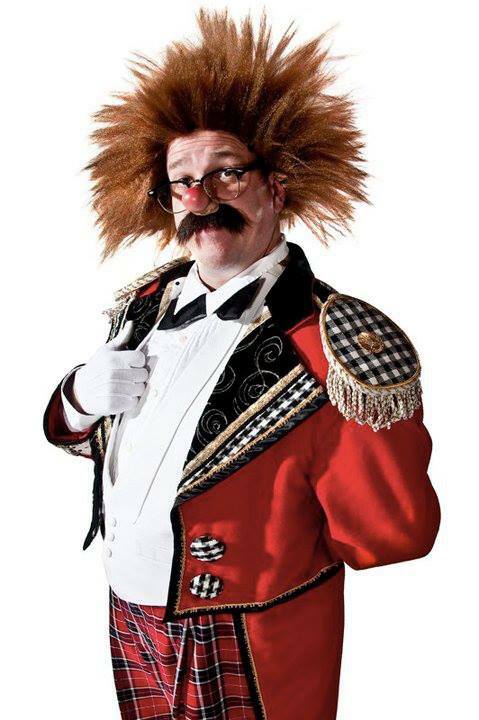 People often ask me where they can get a real yak hair clown wig. I had my custom made in New York but most people don't have the time or money for something like that. After years of trial and error with the dying process my friend Pat Kelly down in Atlanta is now making real yak hair clown wigs, hand-sewn onto cotton skullcaps, EXACTLY the way they have been made for the Ringling Bros. and Barnum & Bailey circus clowns and used on road with the Greatest Show on Earth. Please visit him online by clicking the title of this post and tell him I said "Hi"! I'm not being compensated in any way for this endorsement, I'm just glad that someone has finally been able to create affordable yak wigs and that Pat was the guy to do it. If you've ever compared the look of yak to synthetic there is no comparison. 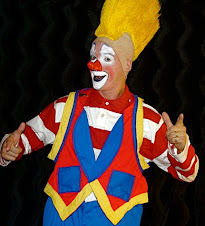 The average non-Ringling clown is about to be able to look a whole lot better!!! 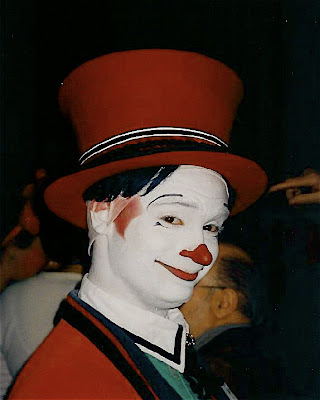 Current Ringling Blue Unit Boss Clown Scott O'Donell a few years back on Vidbel's Olde Tyme Circus as seen through the lens of Paul Gutheil. For more info on Scott, please click the title of this post. 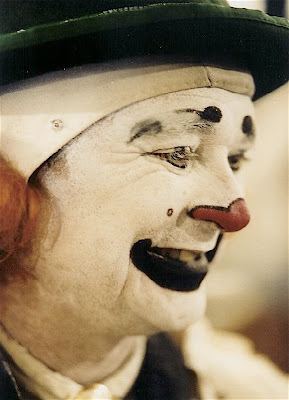 A Paul Gutheil portrait of longtime veteran of the recent Ringling Alleys, Leo Acton. For more info on Leo, please click the title of this post. 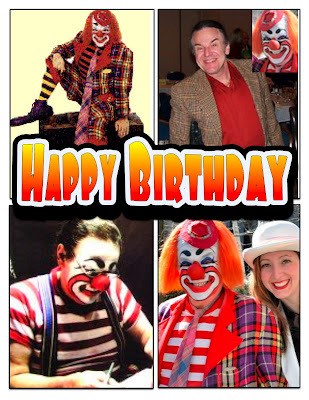 Birthday greetings go out today to Ringling Bros. and Barnum & Bailey Clown College graduate, former Ringling road clown, longtime Ronald and "Clown Arts" educator, the one and only "Mr. Clown"...Earl Chaney. 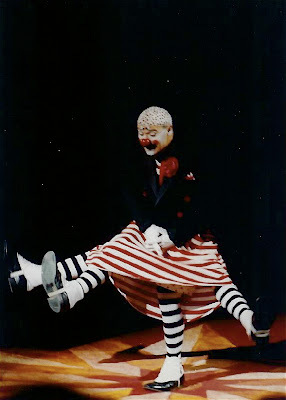 Another great Paul Gutheil photo, this one of Ringling Clown College graduate and longtime star of the Big Apple Circus, Jeff "Le Clown Gordoon" Gordon seen here doing the multi-leg bit. 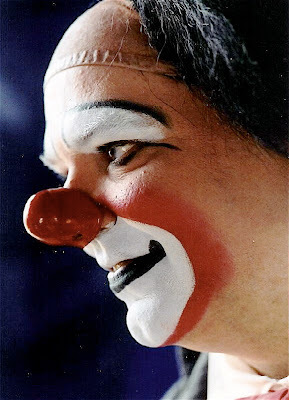 Jeff is the creator of the classic clown bit with the leaf blower and the toilet paper, the one that's been ripped off almost as many times than the bit with the audience volunteers and the four chairs. 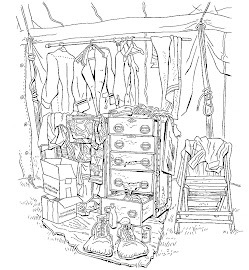 It's a contemporary classic, on par with the Washerwoman Gag in how unbelievably quickly it spread throughout the industry and became a "standard". But it isn't really a standard. It's Jeff's act, which he's still doing. There are many variations on the idea out there but until you've seen Jeff's version, well... "You Ain't Seen Nothin'!" Saturday's photo by E.J. 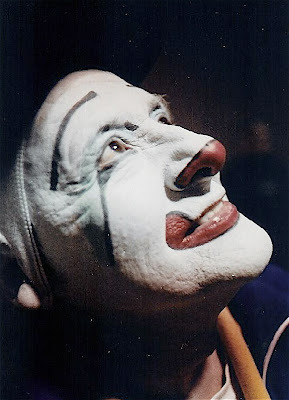 Kelty got me thinking about circus photographers so this week we are going to feature shots taken by, IMHO, the BEST contemporary circus photographer in America, Mr. Paul Gutheil. 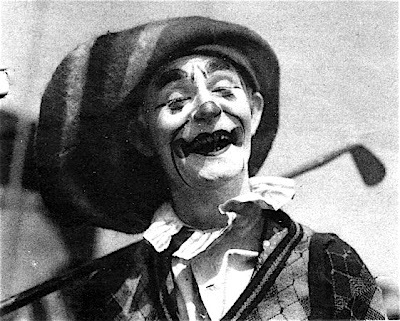 This is an example of one of Mr. Gutheil's candid portraits, a shot of Dusty Sadler taken, post-show, while on the Roberts Bros. Circus. 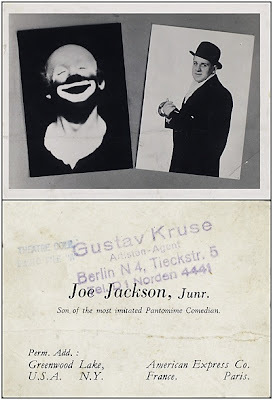 Another great find by circusbtterflygurl, it's Joe Jackson Jr.'s promo photo with hsi contact info on the back. There doesn't seem to be any clue as to the year but the stamp shows that this was used at a theater in Berlin, so it's sometime after 1945. My guess it's from the mid 50s to early 60s.